Rebecca is a former dancer, so not only is she absolutely gorgeous, she’s extremely stylish too! 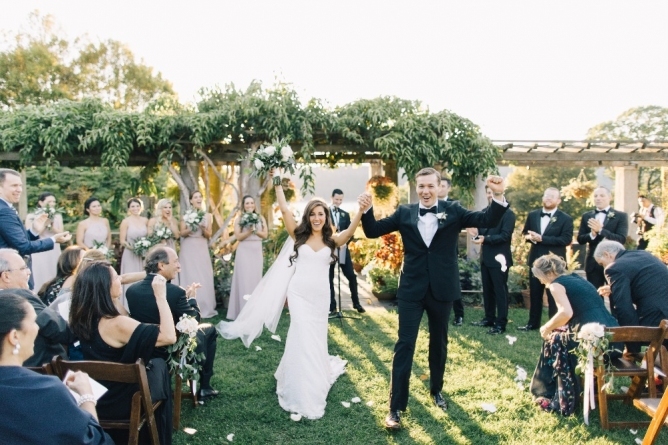 Everything about her and Thibault’s day was beautiful, from Rebecca’s dress to Thibault’s suit to the florals. 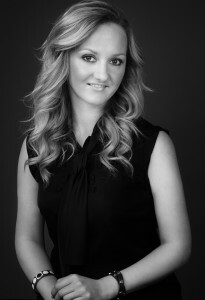 Stacey set Rebecca’s hair in hot rollers to achieve a silky smooth style with body & curls. Once the hair was set, Rebecca went to work with Stacey’s friend Katie Nova (who glams the Ladies on BRAVO TV). After make up Stacey took her set down and added a full set of blond extensions that were pre prepped for long lasting wear.This style was glamourous and lasted all night on Rebecca. 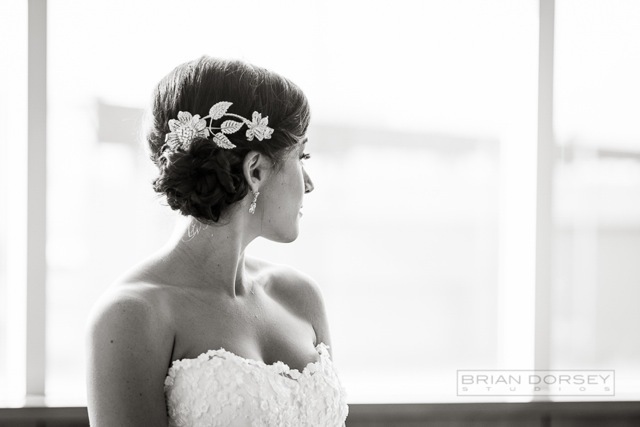 Photos expertly captured by Brian Hatton Photography. 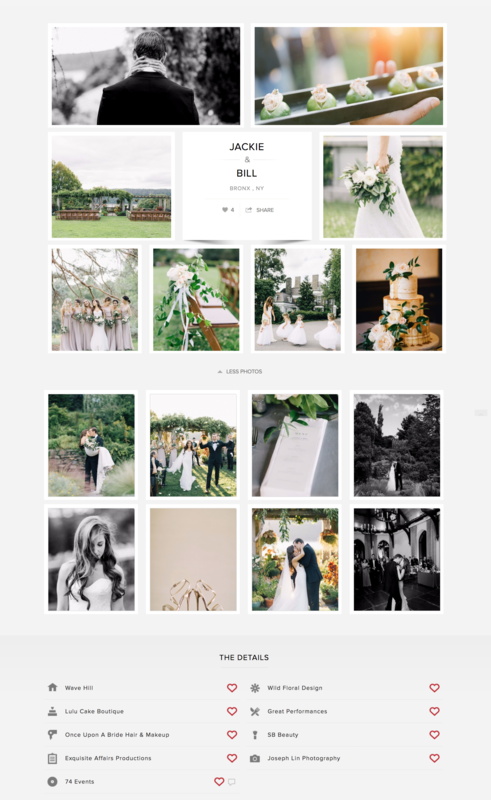 We’ve been featured on Carats & Cake… again! 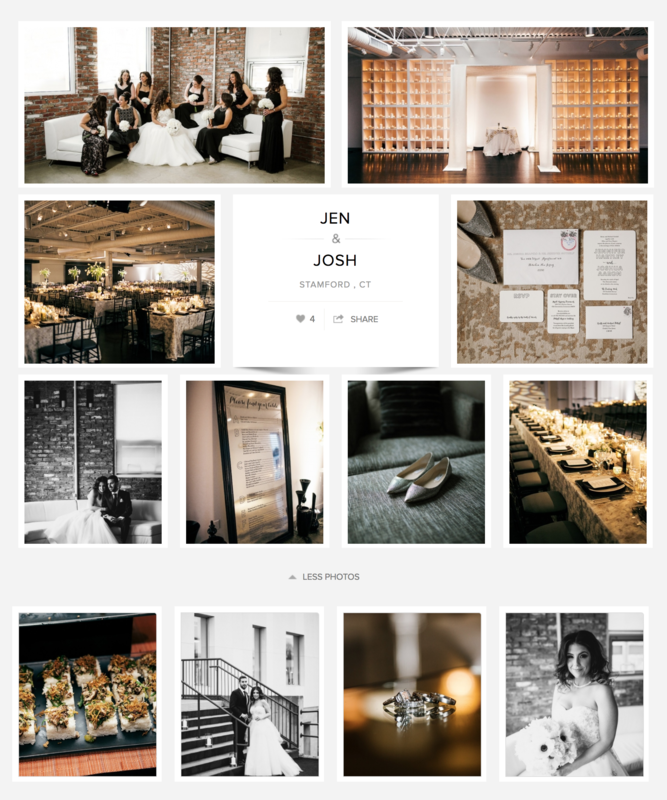 Congratulations to Jen and Josh, we loved being a part of your special day! We have been featured on Carats & Cake again! 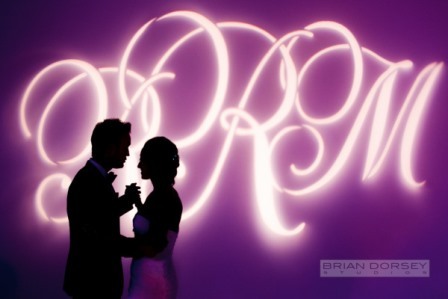 Congratulations to Jackie & Bill on their gorgeous Wave Hill wedding! 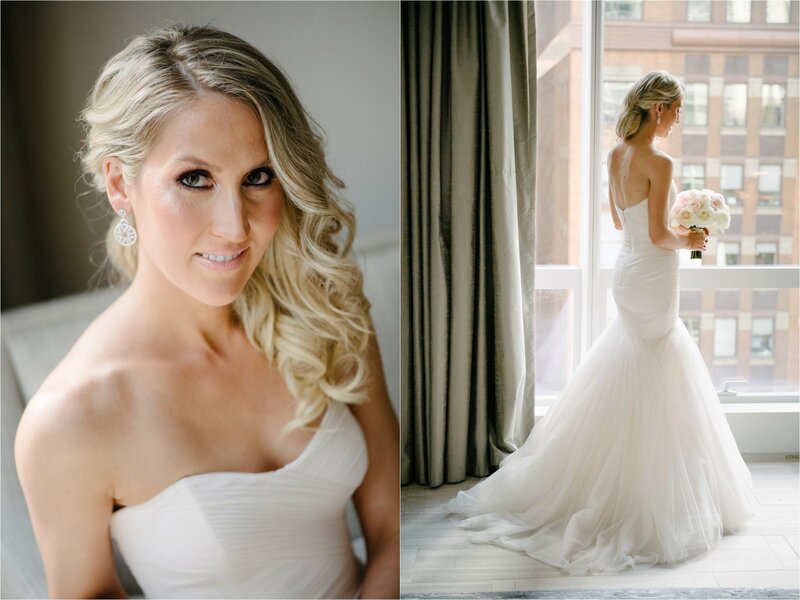 Creating Lizzie’s look for her wedding to Jon at the Plaza Hotel was extra special for me because I’ve been styling her hair for years. After applying Halo Couture Extensions to boost her hair’s length and fullness, I gave Lizzie a chic, simple all-down style. Sofia kept Lizzie’s makeup simple and clean, too, with a soft pink lip that made her look radiant. 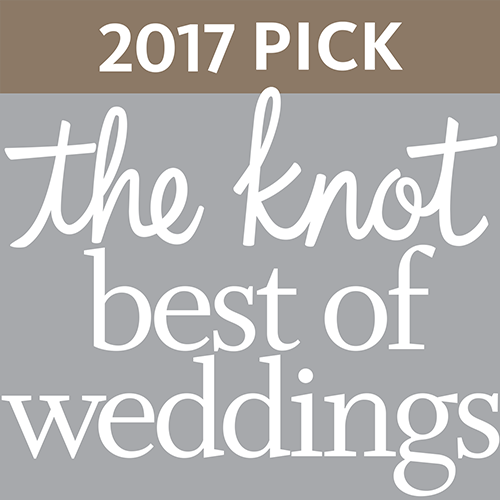 Our team had a lot of fun styling Lizzie’s big bridal party, because they each chose a different hairstyle, ranging from Dutch-braided updos to flat-ironed all-down styles. 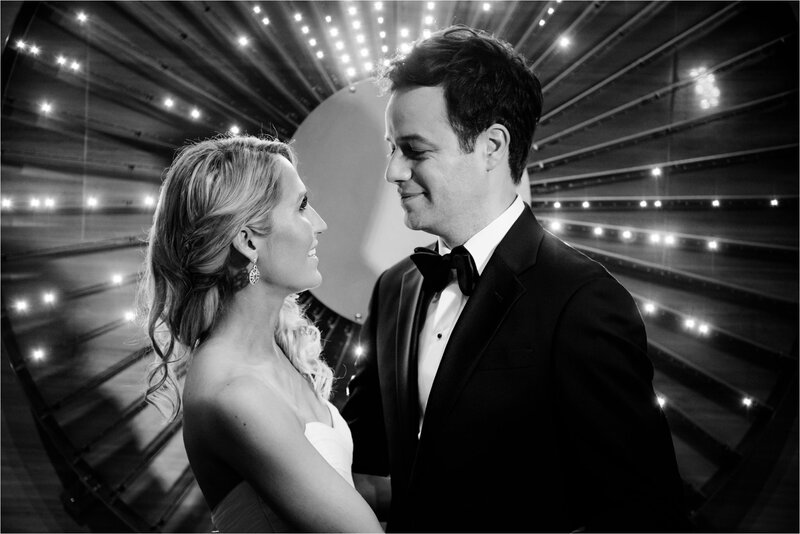 Thanks to Ira Lippke Studios for these shots, which capture the day perfectly. 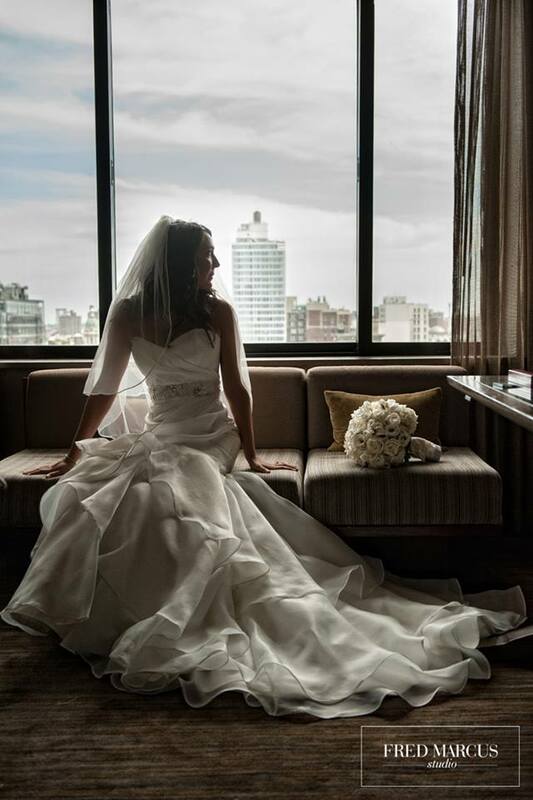 This was truly a classic New York wedding: We helped Lizzie and her bridal party get ready at a suite at the Pierre. 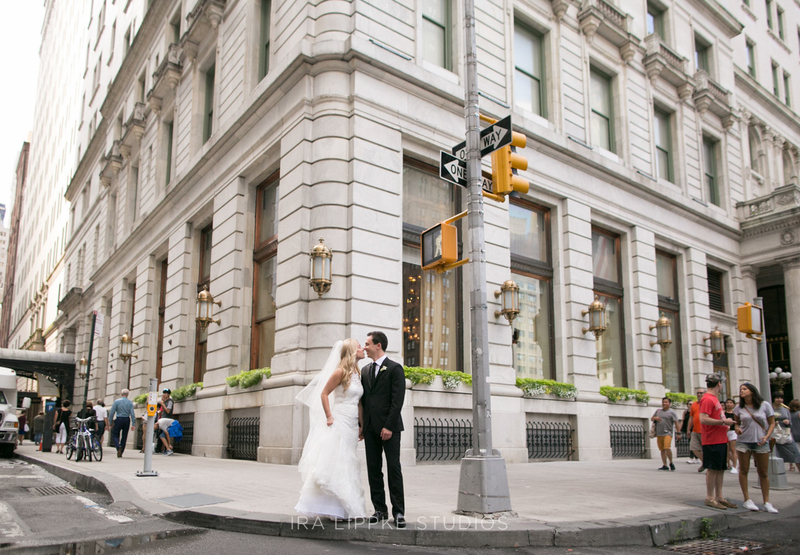 Then they headed to the Plaza for the ceremony and reception, and had photos taken on the city streets. 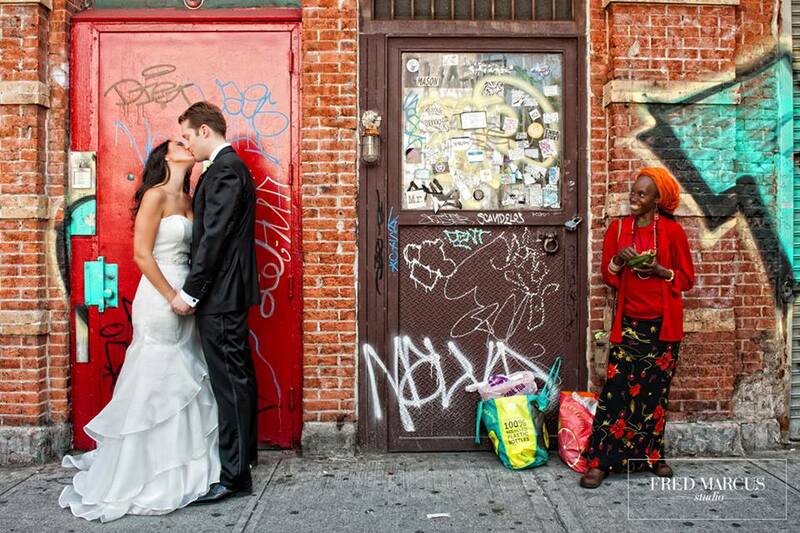 Lizzie and Jon first met in 2009 but fought their feelings for 5 years as they were living in different cities. They finally started dating in 2014 – and I was delighted when they got engaged just one year later. 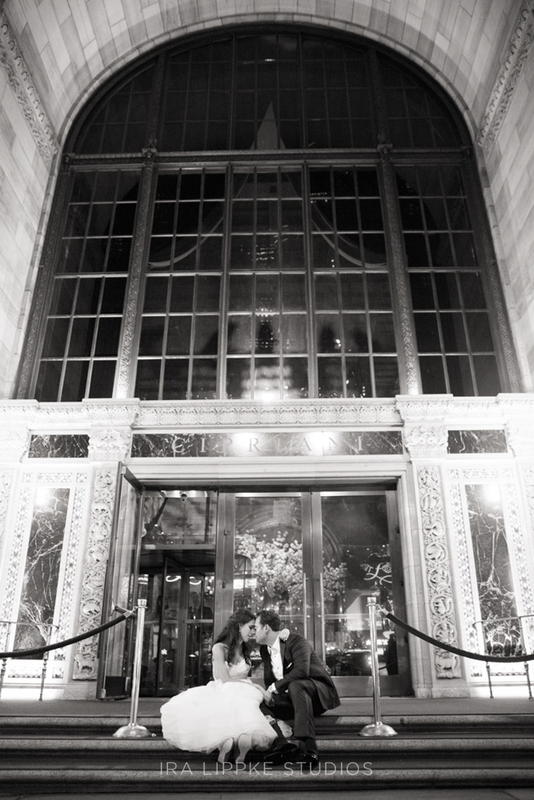 A wedding followed by a Saturday evening reception at Cipriani calls for a truly gorgeous look. So the Once Upon a Bride team used Halo hair extensions to create a stunning half-updo for Nicole. 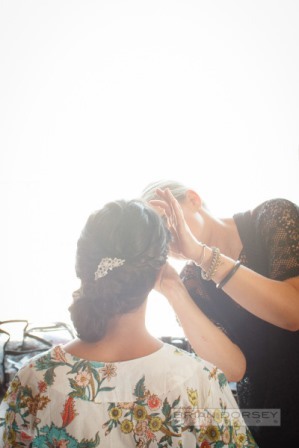 For her bridesmaids, we did glam braided updos that complemented their shimmering dresses. The laughs were flowing just as much as the celebratory champagne as we got all the girls ready — Nicole, we loved being a part of your special day! 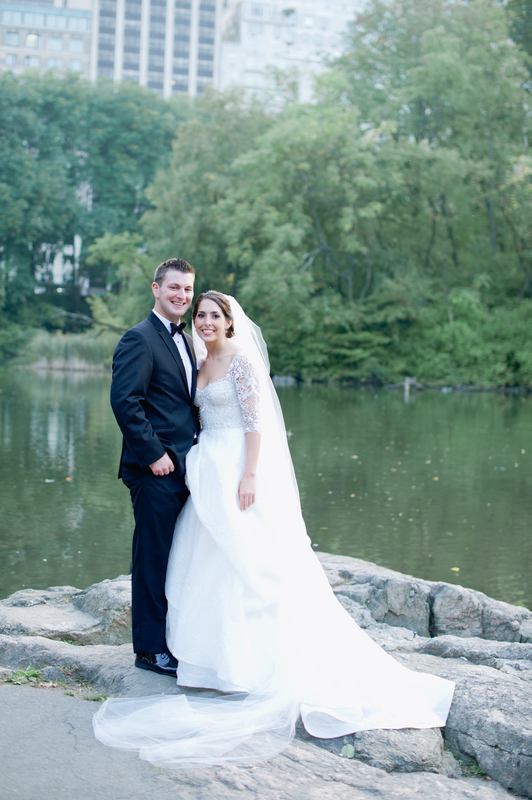 Nathan at Ira Lippke Studios captured the day perfectly in these pics. 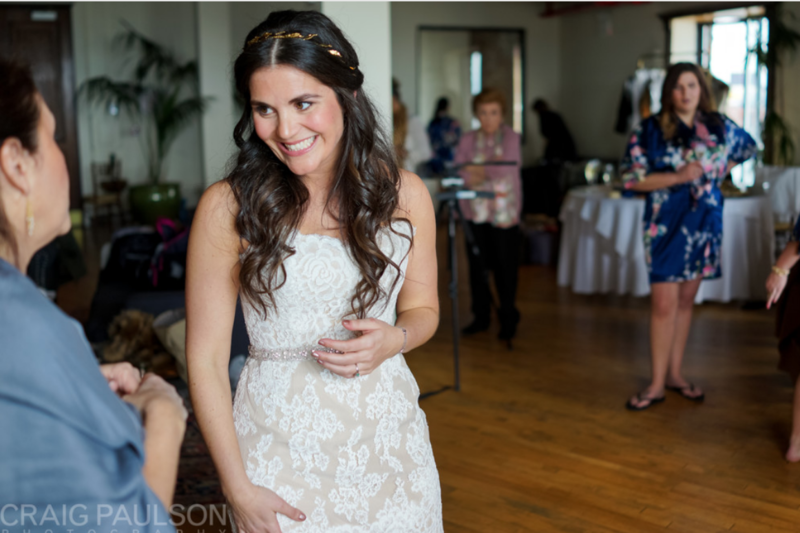 For Agustina’s wedding to Dennis at Liberty Warehouse in Brooklyn, we gave her a pretty half-updo. First, we gave her hair beachy waves then loosely tied them back with twists. 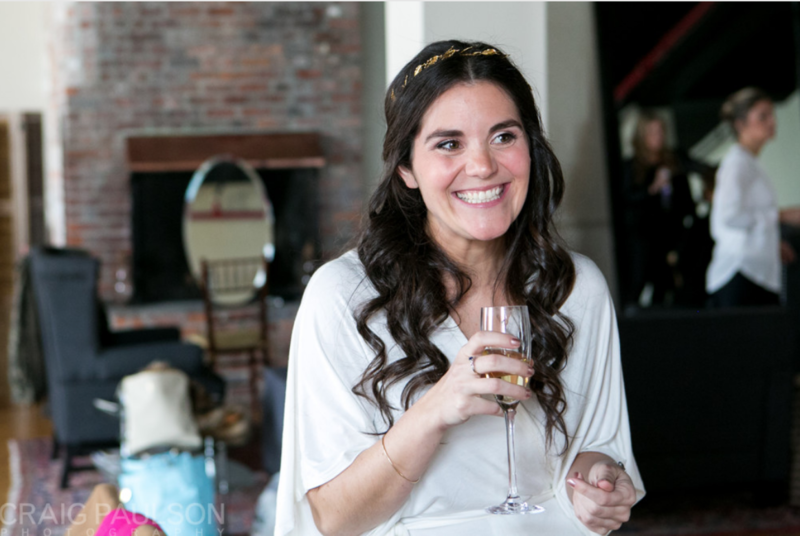 A vintage gold-leaf headband added just the right boho vibe. 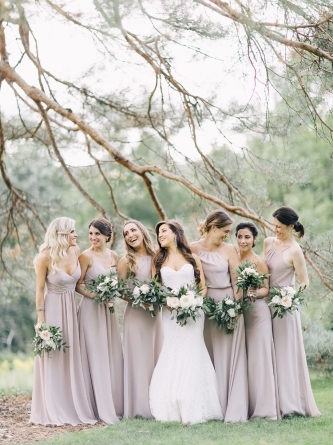 We created a range of chic looks for her bridesmaids. And everyone’s hair and makeup lasted perfectly through the night as they partied, danced, and enjoyed late-night treats from Gorilla Cheese and Wafels & Dinges . . . mmm! These photos by Craig Paulson capture all the joy of the occasion. 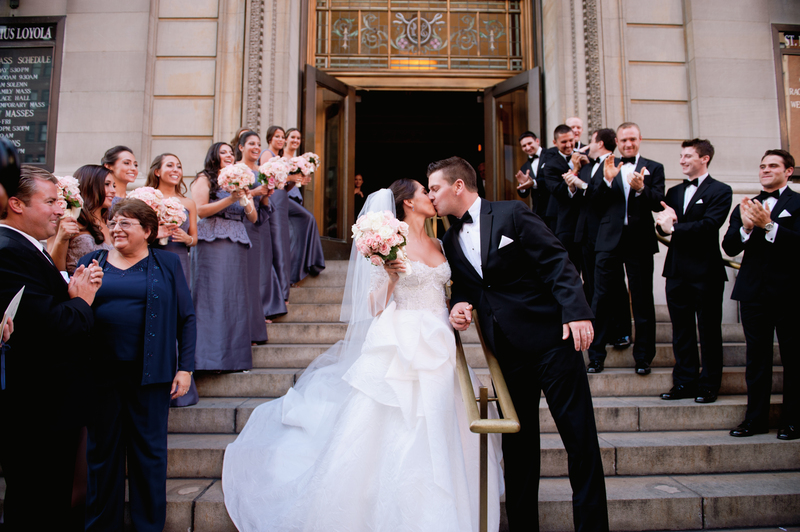 Our gorgeous bride Rachel and her groom, Mark, had a vision to create a New York-inspired wedding – modern, chic, and sophisticated. 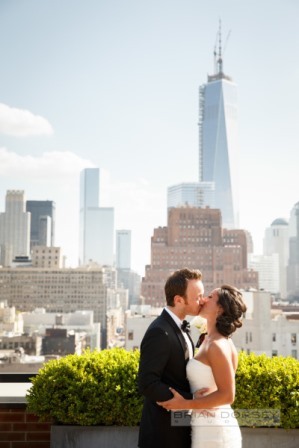 And thanks to the amazing skyline view from Three-Sixty in Tribeca, and the work of the some of the city’s very best wedding vendors, I think you’ll agree the result was everything they could have hoped for. I styled Rachel’s lovely brunette locks into a loose, feminine side updo accented at the back with a jeweled clasp, while Nichole created a dramatic smoky eye. 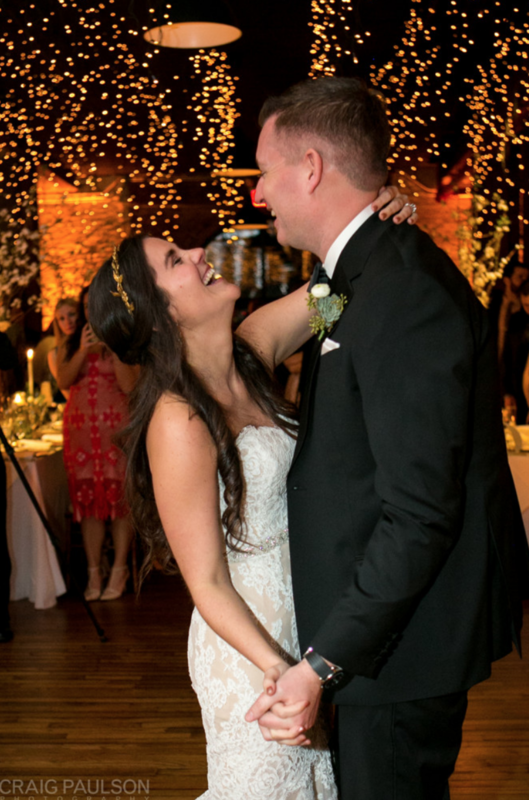 Brian Dorsey Studios did an incredible job of capturing the whole day — we always love working with their photographers, and the results are always fantastic. Rachel wore a gown by designer Peter Langner. 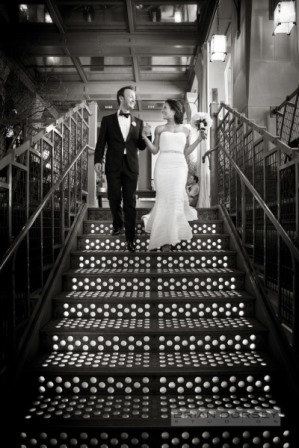 We think the choice of black for the wedding party is genius — such a clean, classic, stylish look. The bridesmaids each chose their own gowns, and the groomsmen wore matching Hugo Boss tuxedos and ties. 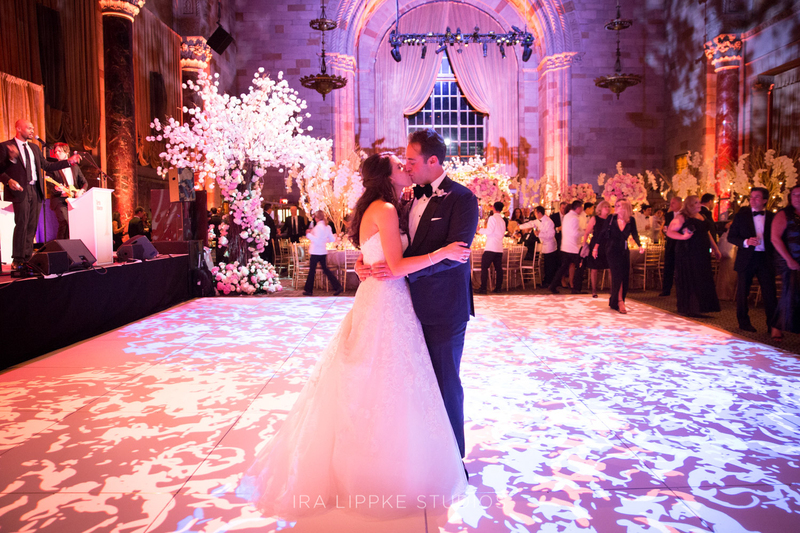 After dark, the venue was transformed by Frost Lighting — the effect was just magical. 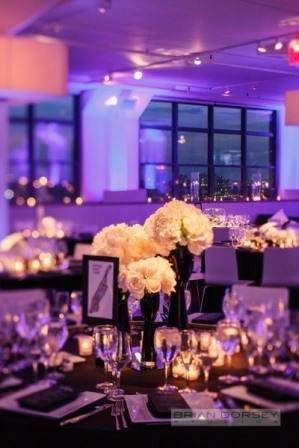 Keeping with the black-and-white palette, Cornucopia Flowers created stunning white floral centerpieces. 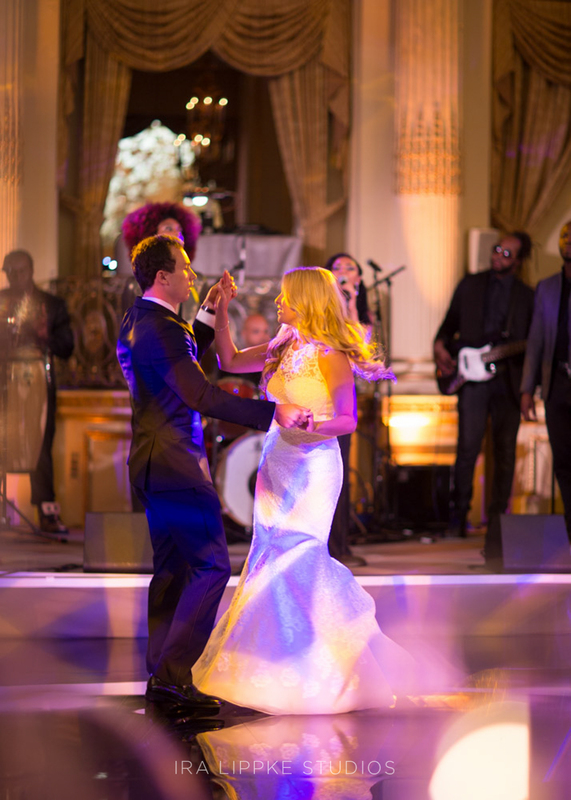 And guests danced all night to the band Carnegie Hill, from Element Music. 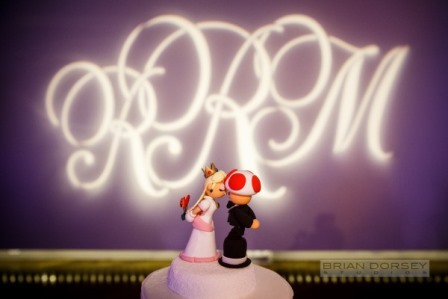 Audrey’s Fine Baked Goods made the couple’s cake, which featured adorable Princess Peach and Toad figurines from the Super Mario games — a cute inside joke shared by Rachel and Mark. 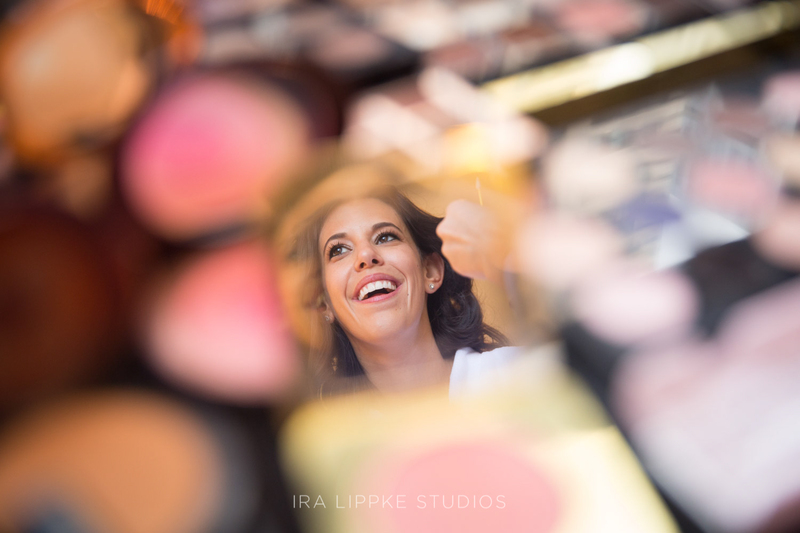 It was a joy to create Rachel’s look for her big day, and also to work with all these great wedding vendors — truly among the best in the business. To see more pictures, go to the full gallery on Style Me Pretty. For brides looking for inspiration on how to use a hair accessory in your wedding-day look, here is a great style created by Angela for our bride Danielle. A pretty jeweled hairpiece by Kate Ketzal adds the perfect finishing touch to a chic side updo, don’t you think? 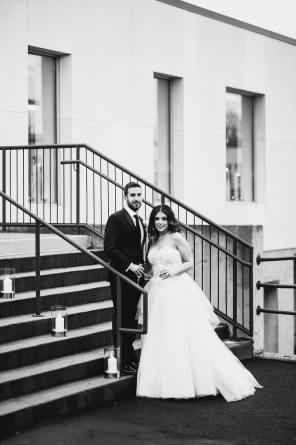 Danielle married Josh at Brooklyn Navy Yard wearing a gorgeous strapless Romona Keveza gown from Wedding Salon of Manhasset. “All the girls loved their hair and makeup,” says Danielle. 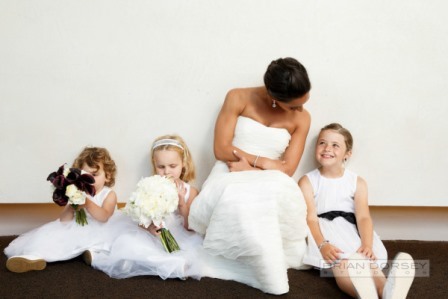 The bridal party were running a little late — and at Once Upon A Bride we know how stressful that can be on your wedding day, so we always create a calm and fun environment and give you peace of mind. “I really have to thank our makeup artist, Karen, especially, because she was so calming and kept me laughing the entire time,” says Danielle. 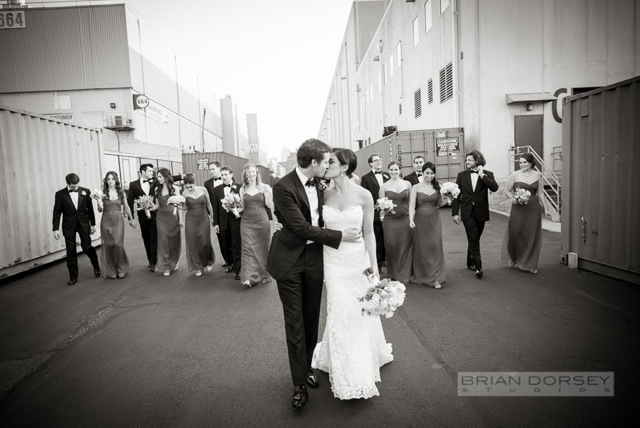 As always, Brian Dorsey Studios captured the day beautifully, as you can see from these pictures. And we love the bridesmaids’ fuchsia gowns, which were stunning with their lovely bouquets by Atlas Floral. 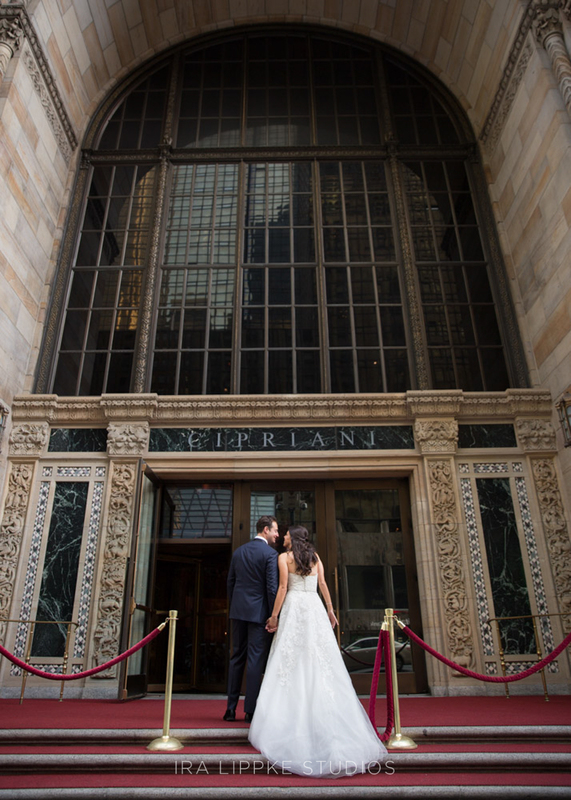 We think our bride Morgan was the picture of classic bridal elegance for her wedding to Bud on Park Avenue, at St. Ignatius Loyola church. 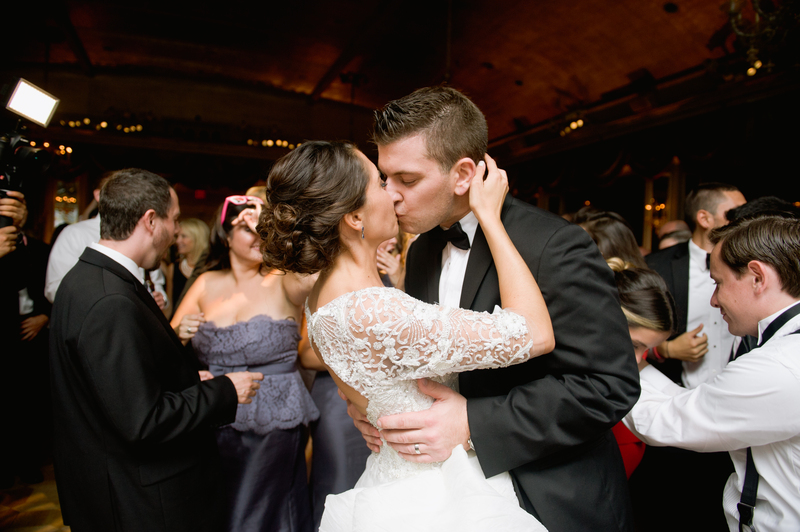 Her stylist, Stefanie, created a soft and feminine updo to complement her lacy, light-as-air Monique Lhuillier gown. Stefanie added a touch of glamor to the look with jeweled hair accessories. Kate Connolly Photography took these gorgeous shots. “Stefanie was amazing!” says Morgan. “She did my hair, my three sisters’, and my mom’s – it is a very opinionated, picky bunch, and everyone loved their hair. She was an absolute pleasure to work with. She was so flexible in adjusting the hair style if need be and knew how to make it look amazing in a short amount of time. Morgan and Bud’s marriage was the culmination of years of long-distance romance. They shuttled back and forth between New York City and Boston, their studies and careers sending each of them to both of these cities — just never at the same time! In 2010 they were finally both able to be in New York City . . . and then Bud’s job transferred him back to Boston and they had to spend another six months apart. 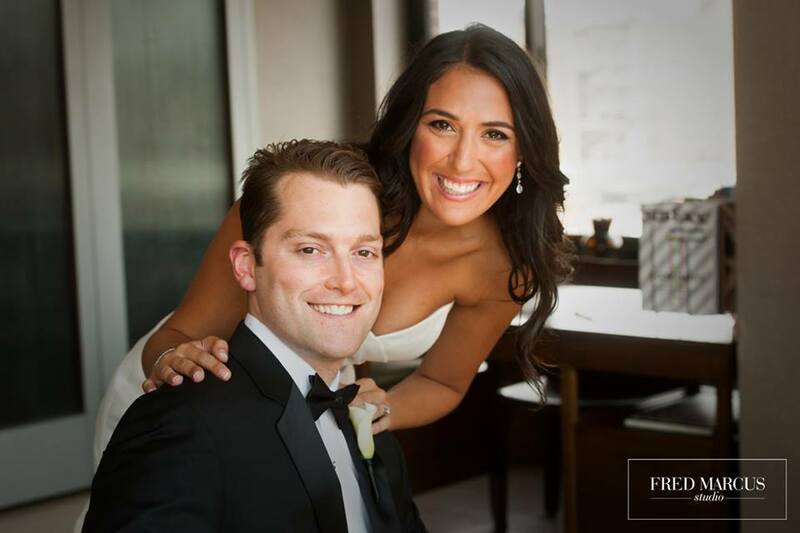 The couple have now settled in an apartment in downtown Boston and are loving married life. 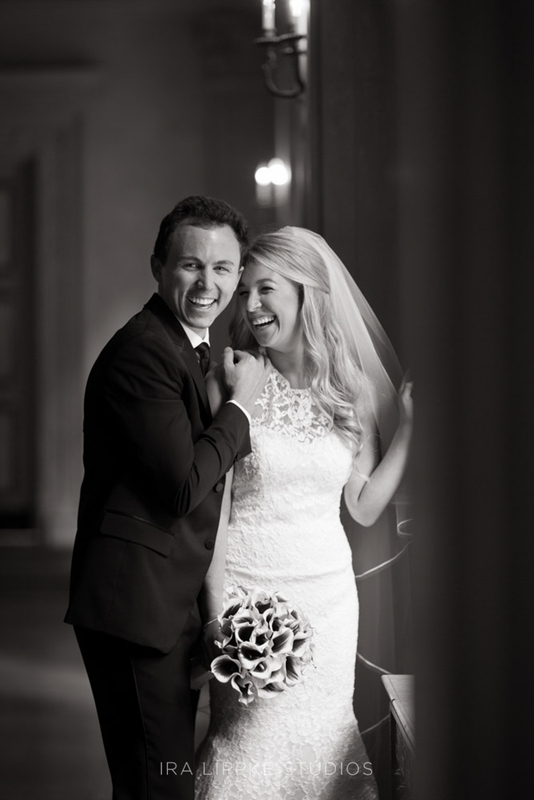 We are so happy for them and delighted that we could be a part of their special day! 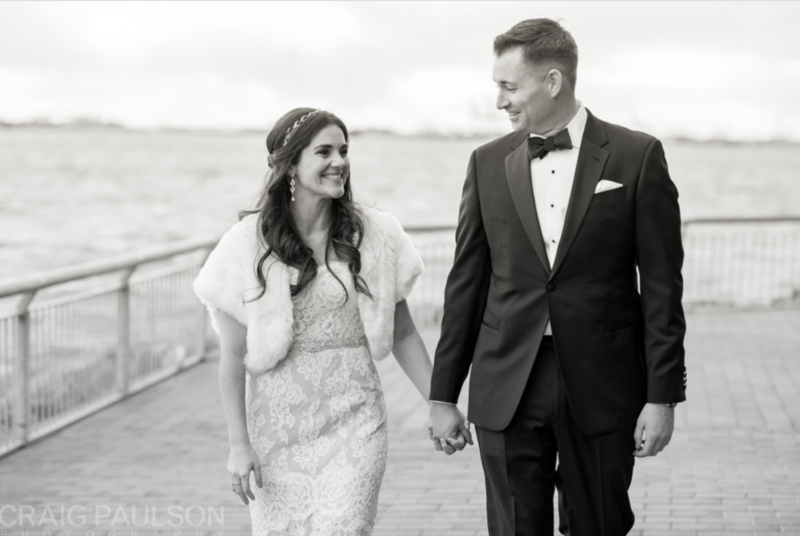 When our bride Lisa wed Jeff recently, a loose, romantic, and oh-so-feminine style seemed like the perfect look for her long brunette hair and classic veil. To achieve this style, I set Lisa’s hair with electric rollers, used a set of extensions (so natural looking you would never know, right? ), and used Oribe Volumista for extra luster and volume. 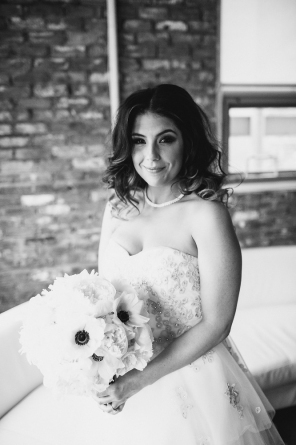 Makeup artist Sofia brought out Lisa’s own glow with a natural blush and soft pink lip color, and accentuated her beautiful brown eyes with dramatic smokey makeup. 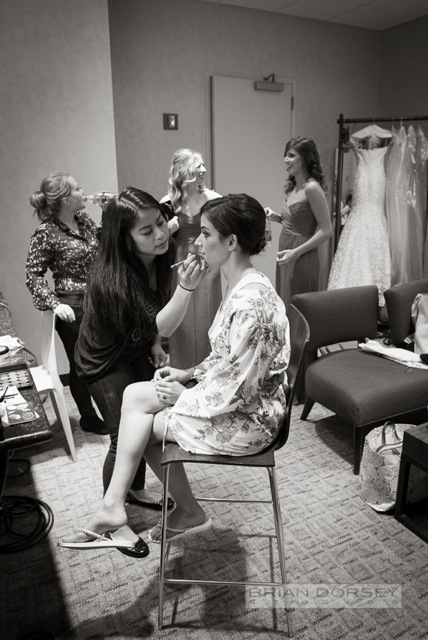 It was a team event for Once Upon A Bride, with Angela and Karen coming to help get Lisa’s big bridal party ready. 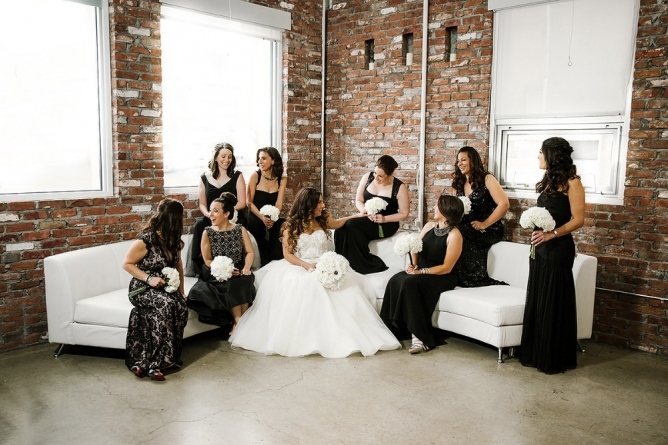 By the way, we love the bold, chic black that the bridesmaids wore — very striking against Lisa’s amazing white sleeveless gown from Impression Bridal. 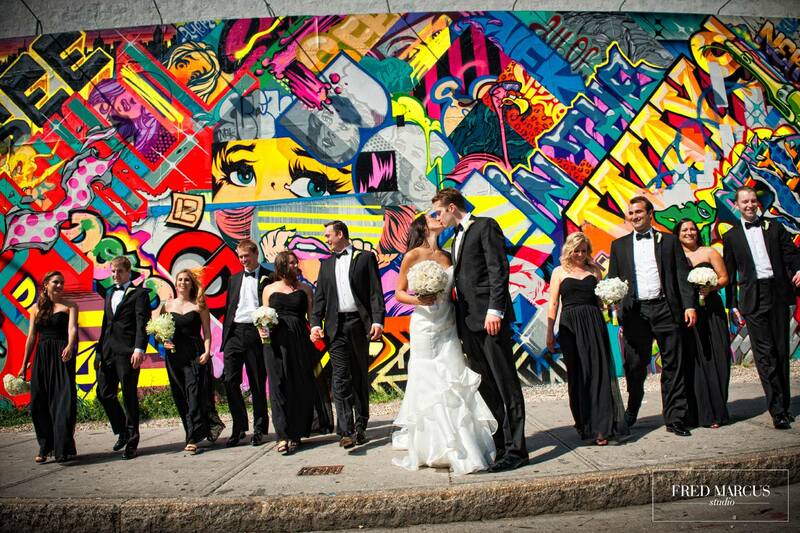 We also love the very cool backdrops Felix from Fred Marcus Photography used, like the bright graffiti on Houston St in SoHo, and the interior of the Soho Grand Hotel. 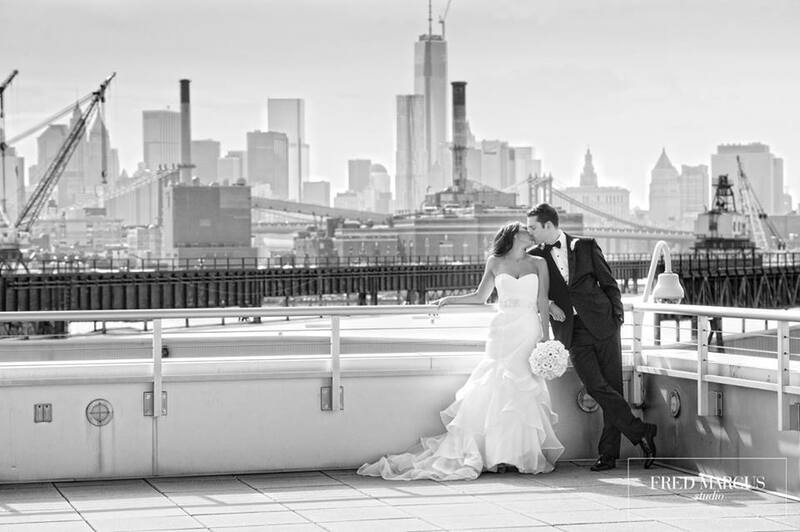 And that view of the skyline is seen from Stage 6 at the Steiner Studios complex in the Brooklyn Navy Yard, where Lisa and Jeff tied the knot. Because it’s so important that a bride’s hair is in perfect condition on her wedding day, we use Oribe luxury haircare products. Our stylists swear by Oribe’s line of conditioning gels, oils and sprays that hold, and skincare-grade shampoos are all lightly scented with specially commissioned French perfumes. So we are honored that when Oribe wanted to find out the latest bridal hair trends and tips, they called upon Stacey. Now we’re letting you in on their Q&A session. Find out what to watch for in the coming seasons, and how to get your hair in gorgeous condition for the day you walk down the aisle . 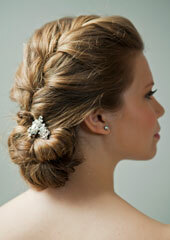 . .
What are some of the top bridal hair trends for summer 2013? Braids are still really in, with fishtails being the most popular. 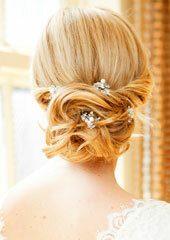 Brides are opting for side parts over center parts and hair that’s clean, youthful, and smooth. We’re also seeing a lot of sleek updos that lie low on the nape and don’t have as much texture as in previous seasons. 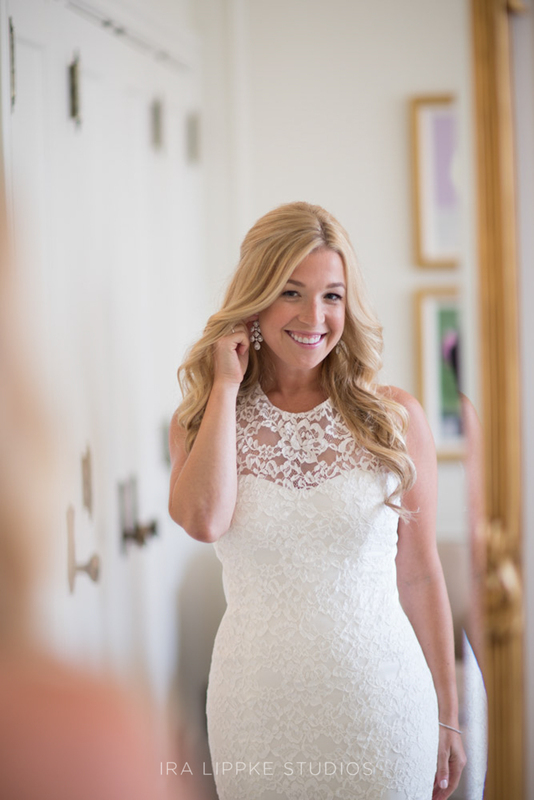 How do you determine what style to do on a bride? I first get to know her personal style—what she wears as an everyday look and what she does for the weekend. You don’t want to stray too far from who she is. I then look at the dress and figure out something that matches both the style of the gown and the bride’s personality. What do you do if a bride asks for a look that you don’t think will work for her? A style can look completely different depending on the person’s face shape, hair color, texture and more, so what works on a celebrity or a friend may not work for you. I ask my clients to only bring in pictures of people with at least their same texture and hair color. If they bring in options that won’t work, I try to present similar styles that I think would complement them and their dress. What styles work best for various dresses? If the dress has a high neck, hair should be up or off to the side. I suggest a low ponytail, chignon, or side braid. For a sweetheart neckline, I like to see the hair down to minimize the amount of skin showing–too much skin can distract from the beauty of the dress. When a dress has an asymmetrical top, it’s important to maintain balance. Contrary to what you may think, you want to style the hair on the side that has the strap or the most weight so that you don’t confuse the eye and force it to choose where to look. 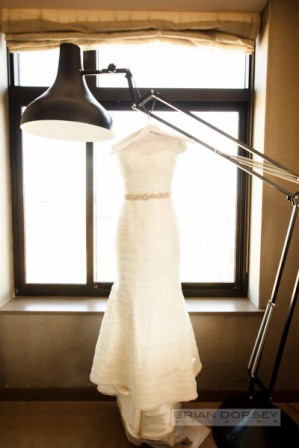 How can brides inject some personality into a more traditional look? Accessories can really help add a bit of the bride into the hair. Flowers or something meaningful like an antique brooch can add a special, symbolic touch. What about bridesmaid hair? 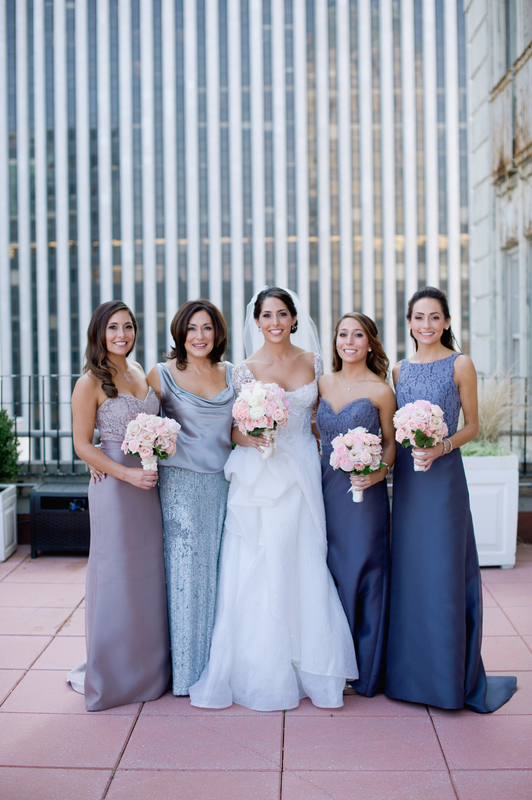 How can the bridal party’s style complement the bride’s? 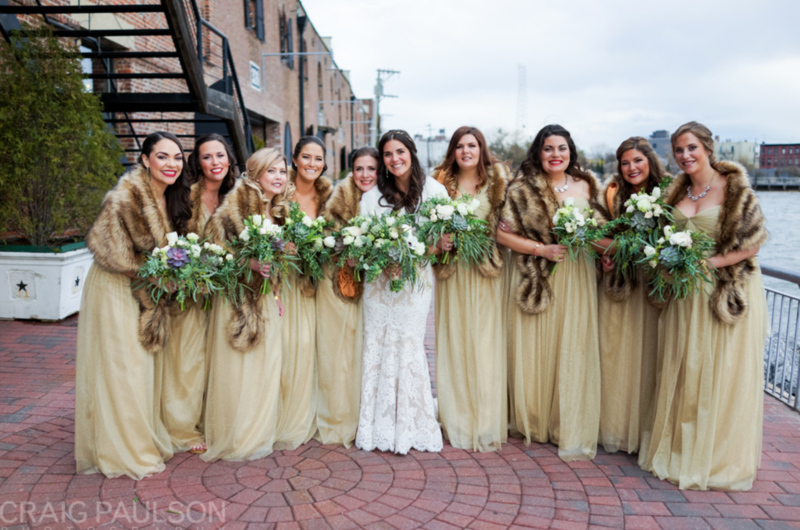 The bride’s hair should dictate her bridesmaids’ styles. I like for everyone to have a similar vibe but with slight variations. For example, if everyone is wearing their hair half up, you can modify the look with braids, twists, and more. What are some of your tricks for keeping hair in place from the walk down the aisle to the last dance? First of all, brides should always arrive with day-old hair; styles stay in better when the hair has some oil, and overly washed hair can be slippery. 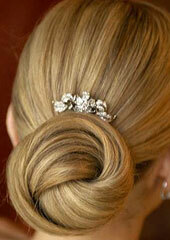 If a bride’s hair is too silky, the stylist should use Dry Texturizing Spray to add some texture and cut the gloss. It makes it much easier to work with the hair and helps secure pins. How can brides prevent helmet head from too much hairspray? Everything should be done in prepping the style so that the hairdresser doesn’t have to “shellac” it at the end. Using the right products and tools while prepping the hair is essential to getting a style that looks natural and stays in all night. You should only need a light misting of hairspray at the end. 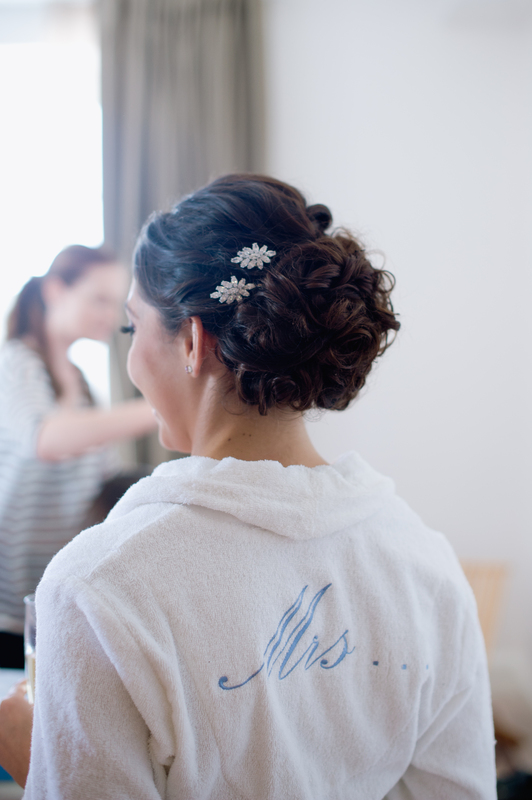 How can brides prep their hair for the big day? I give the bride shampoo and conditioner samples at our initial meeting and encourage her to use quality products to get her hair into great shape for the wedding. 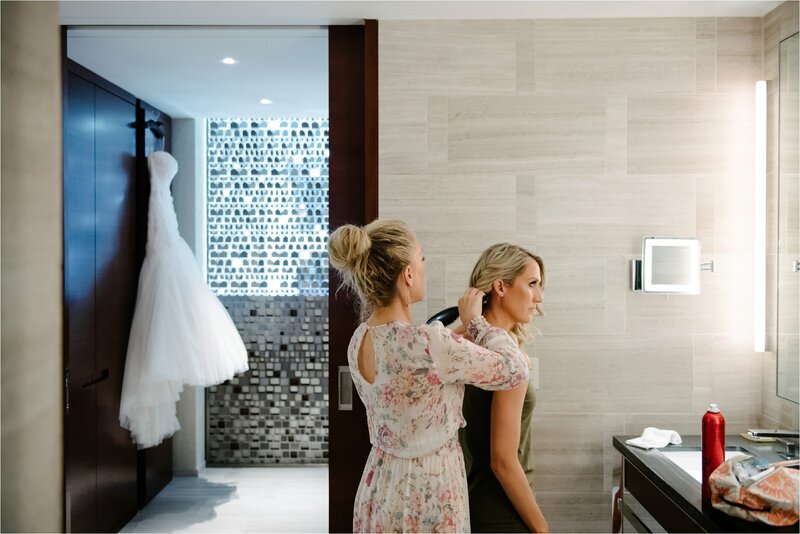 If the bride needs cut and color services, I recommend doing those two weeks beforehand—that allows time for any necessary fixes and gives you time to re-book if your stylist or colorist happens to get sick and cancel your appointment. 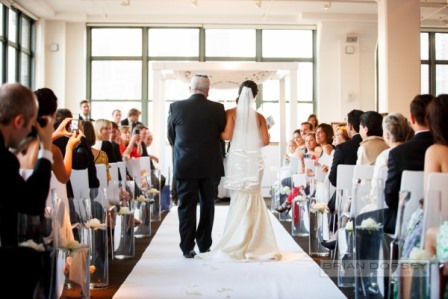 How can brides prep for bad weather? Always go into your wedding day with two options that you love—one for good weather and one for bad. A lot of girls will go for something slicked back out of fear that it will be humid and their hair will frizz, but it may not necessarily be the style they’ve been dreaming of. Make sure your stylist knows both. 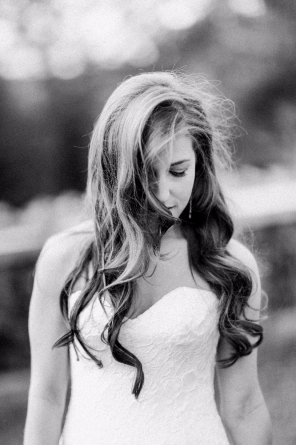 How can brides touch up their hair throughout the night? If hair starts to fall out or fall flat, have a few products handy to refresh your style. I like to give my clients Oribe purse-size sprays for touch-ups. 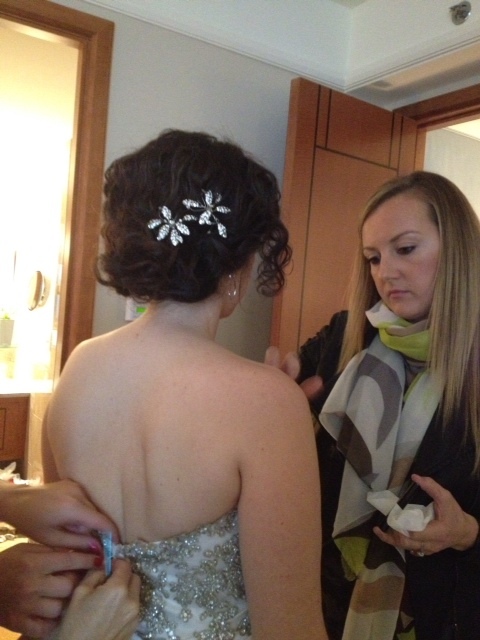 It’s so important to have a great relationship with your wedding hair stylist and makeup artist. 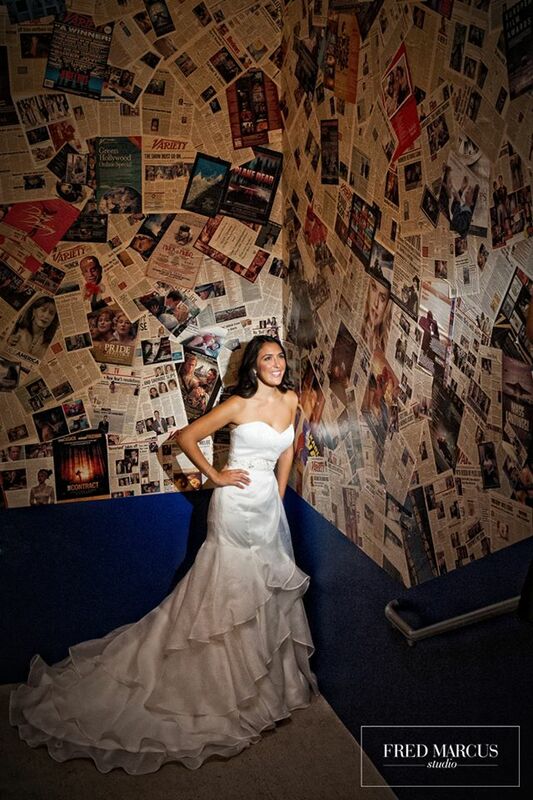 You need artists you can trust to bring out the most beautiful you and make you feel fantastic on your wedding day. So you can get to know our artists a little better, I’ll be regularly featuring them here on the Inspiration page, so be sure to check back. First up is the amazing Sofia Beskasnova, who has more than a decade of experience as a professional makeup artist since starting out with MAC Cosmetics. Sofia, who is Russian and was born and grew up in Latvia, studied makeup at film and television school. She learned all the skills of glamour, red carpet, special effects, and film and TV prosthetics — but her real passion was women’s beauty. Sofia is well known at the Paris, Milan, and New York fashion weeks, where she has been doing runway makeup for the past 12 seasons. She has worked with Diane Von Furstenberg, Oscar de la Renta, Marc Jacobs, Vivien Westwood, Reem Acra, and Monique Lhuillier. Sofia’s celebrity clients have included Lady Gaga, and her work has appeared on shows such as TLC’s Say Yes to the Dress and Bravo’s Miss Advised, Bethenny Ever After, and Project Runway. Her work can also be seen in GQ, Allure, and the Harper’s Bazaar runway report. 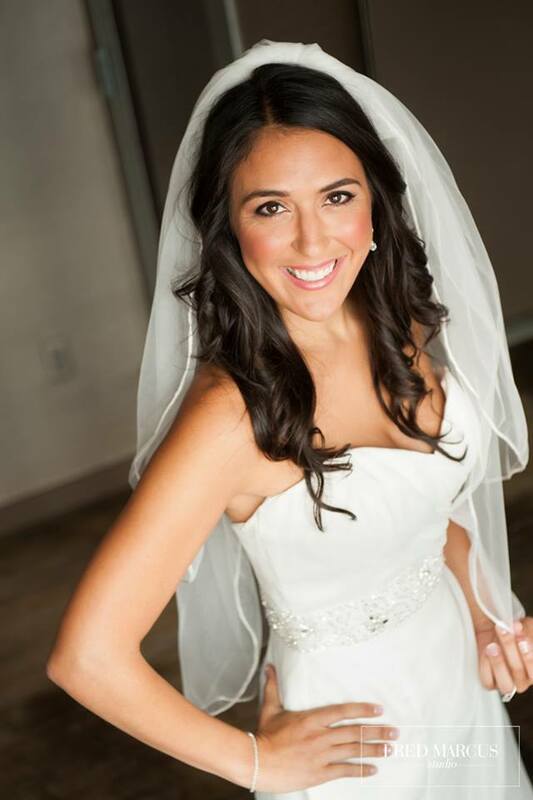 Every time I see a bride get to know Sofia during a makeup trial, the bride leaves our salon feeling absolutely confident and excited about her upcoming wedding day. Sofia becomes friends with most of her brides, and they often become lifetime clients. When I shot my video for this website, I had Sofia do my makeup — she did an amazing job. 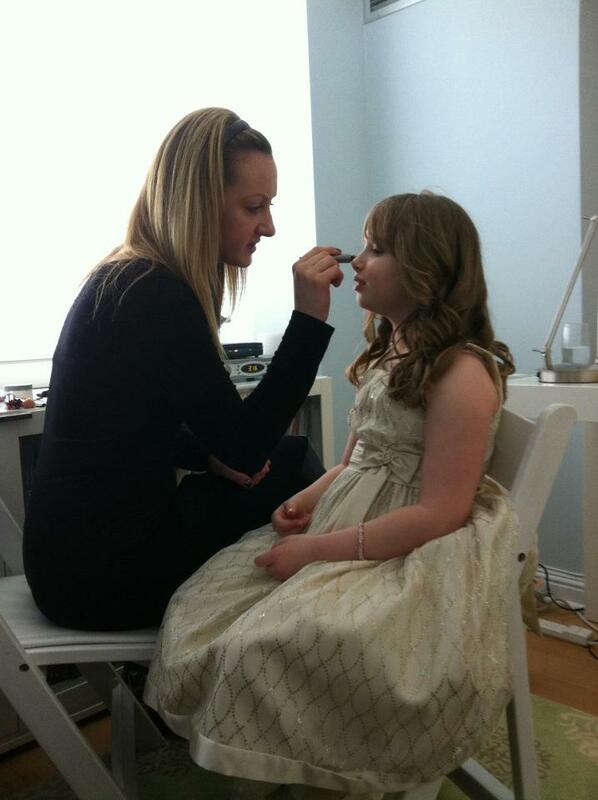 Sofia also loves doing makeup for our brides’ flower girls.